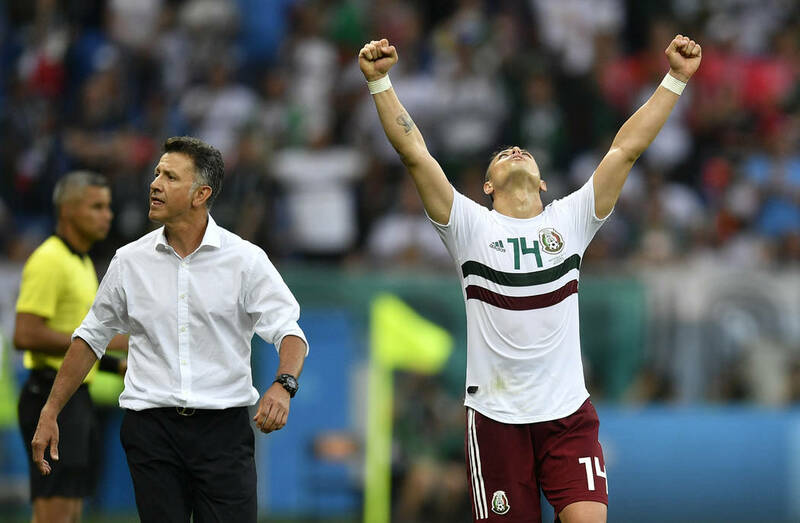 Mexico, which can clinch a spot in the round of 16 with a win or draw Wednesday against Sweden, was as high as 66-1 at CG Technology, which took a $500 wager to win $25,000 at 50-1 odds and a $250 bet to win $15,000 at 60-1 odds. In a World Cup without the United States, Mexico is the largest liability at Las Vegas sports books. If El Tri wins the World Cup, it would result in a six-figure loss for the Westgate sports book, which opened Mexico at 50-1 odds in its futures book. “Our only liabilities are small on Germany and Mexico’s the big one,” Westgate sports book manager Jeff Sherman said. Mexico would cost the Wynn Las Vegas sports book almost six figures, while CG Technology sports book would take a five-figure hit. “They’re the only team that we’re a loser to,” CG Technology sports book director Jason Simbal said. El Tri is a 20-1 shot at adjusted odds to win it all at the Westgate. The books split on Mexico’s first two games, winning on its 1-0 upset of Germany before losing on its 2-1 win over South Korea. Brazil is the largest liability at Wynn Las Vegas while the biggest World Cup bet placed at CG Technology was a $10,000 wager to win $45,000 on the Selecao. After 16 of the first 25 World Cup games went under, 10 consecutive matches went over the total. The run ended Monday afternoon when Portugal and Iran played to a 1-1 draw. The odds to win the 2019 NBA title have continued to fluctuate based on where LeBron James is expected to play next season. “It’s sounding more and more the last couple weeks that LeBron is mostly deciding between the Cavaliers and Lakers,” Sherman said. Cleveland opened at 30-1 on June 2 and was as high as 50-1 on June 18 before action on the Cavaliers dropped the price to 12-1. The Lakers opened at 20-1 on June 2, were 8-1 on June 18 and started Monday at 12-1 before a $4,500 wager on Los Angeles moved its odds back to 8-1. The Philadelphia 76ers’ title odds have moved from 7-2 on June 2 to 15-2 on June 18 to 14-1 on Monday. “The Sixers are not seeing as much support because it’s sounding less and less like they’re an option for LeBron,” Sherman said. The Boston Celtics are the 4-1 second choice after opening at 8-1. The Golden State Warriors are the even-money favorites to win their third straight title. “The only way that will really change is if LeBron and George went to the Lakers and took young players and got Kawhi (Leonard) in a trade,” Sherman said. But that appears unlikely to happen amid recent reports that the San Antonio Spurs will not trade Leonard to a team in the West. For the first time, the Westgate sports book has posted odds on college basketball teams to make the Final Four. UNR is the 3-1 fifth choice behind 5-4 co-favorites Duke, Kansas and Kentucky and 7-4 fourth choice Gonzaga. The Wolf Pack will return the Martin twins, Caleb and Cody, and Jordan Caroline to a team that lost by a point to Loyola-Chicago in the Sweet 16. UNR also will add five-star recruit Jordan Brown and Old Dominion transfer Trey Porter. Loyola-Chicago is a 100-1 long shot to get back to the Final Four.